A well-cared for car not only looks good, but it also retains its value longer. It's a lot easier to trade in or sell a car that looks like new, and you can get more money for it. What does it take? 1. Repair stone chips and scratches before they get rusted, see how to do it below. 2. 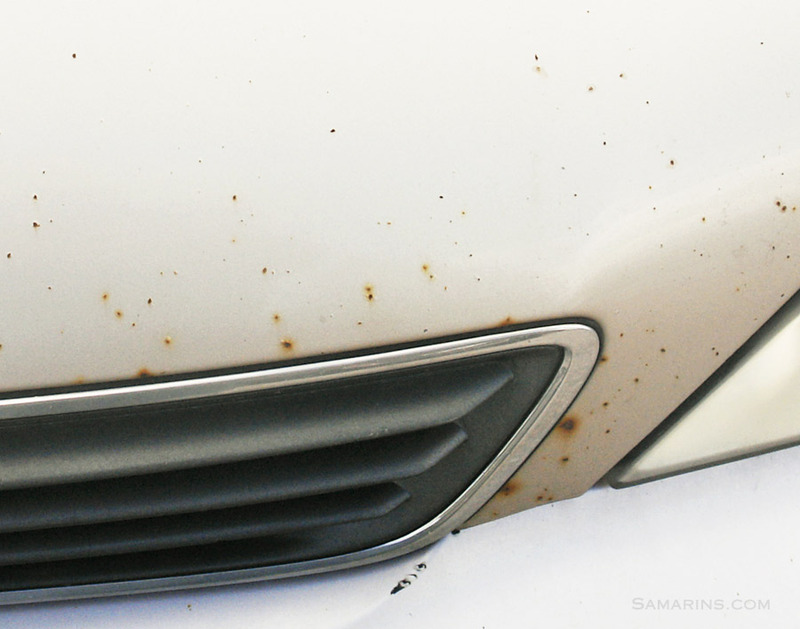 If you live in the Rust Belt, rustproof your car from underneath, scroll down to see why. 3. 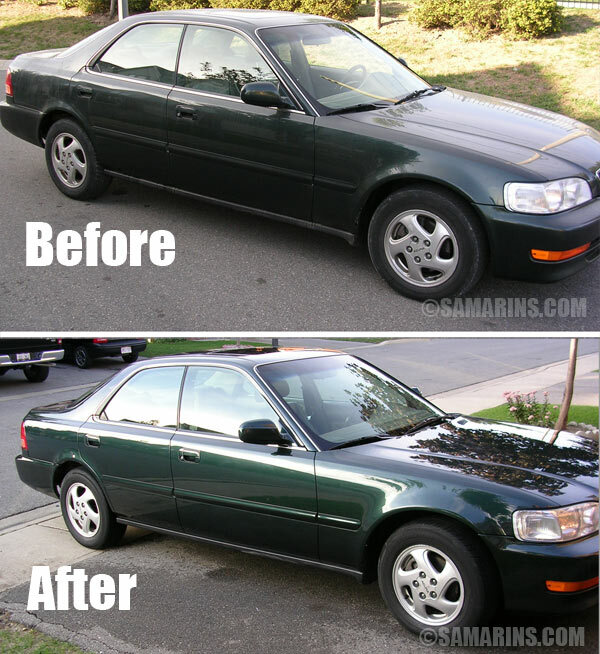 Wash you car, it can be done in 10 minutes, see how. 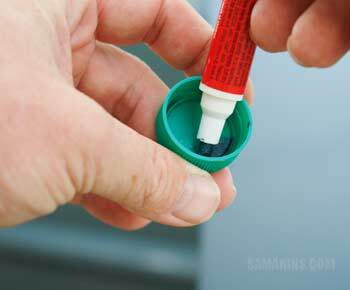 Bird droppings and tree sap will leave stains that will be much harder to remove if not washed off in time. 4. 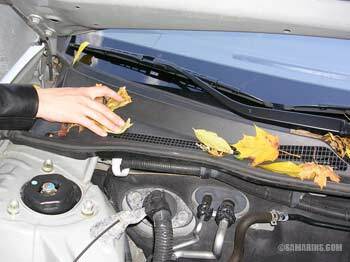 Remove leaves and other debris accumulating below the windshield and in water channels around the trunk and around the sunroof to prevent rust in these areas. 5. Wax you car at least once a year. 6. If your headlights are getting fogged up, buff them out, it's not too difficult to do even without an electric buffer. Stone chips and deep scratches will rust if not repaired. 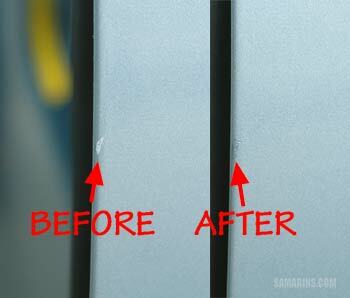 Stone chips and deep scratches will rust if not fixed in time. There are several ways to repair them. It doesn't take more than half an hour if the car is clean. The touch up paint is sold in cans or touch-up pens. 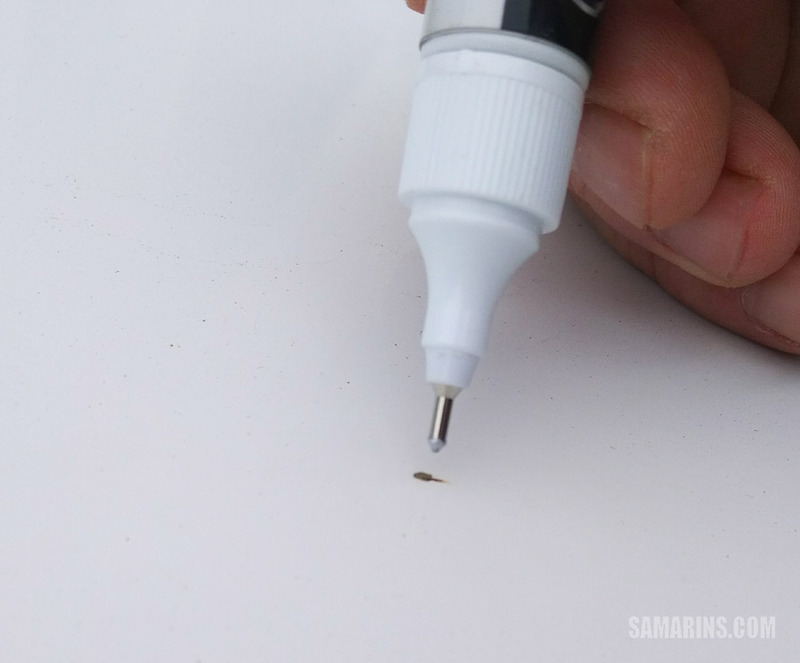 Some touch-up paint have a thick marker-like tip, others have a sharp tip. Let's see how to use a pen with a marker-like tip. You can purchase a touch-up pen from your dealer or online. 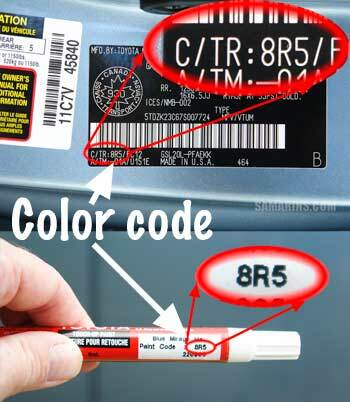 To order a touch-up pen, you need to know the color code of your car. 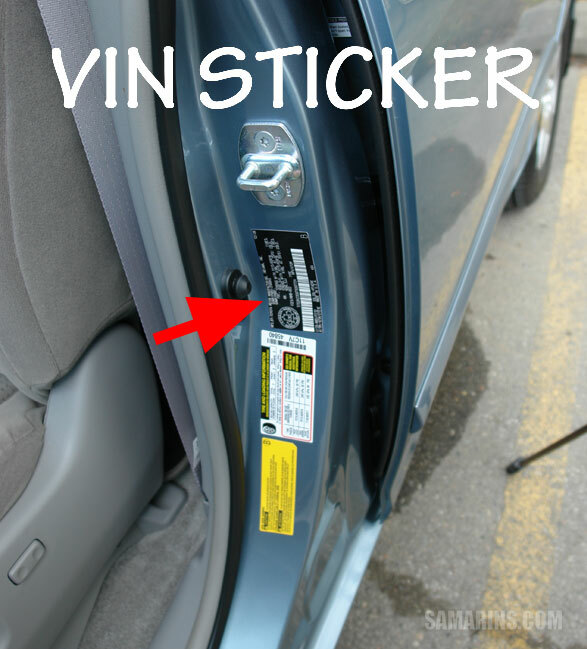 You can check the color code on your VIN sticker that in most cars is attached to the driver's door jamb. Look under "Color / Trim" or "C/TR". This car's color code is 8R5. 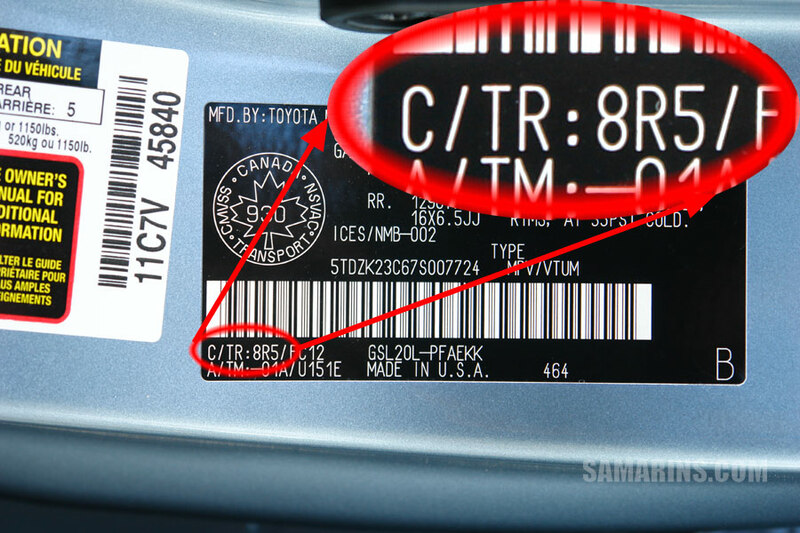 The parts advisor at your dealership can also check the color code by the VIN number. It's easier to work in a shade, because if it's too hot, the paint will dry too quick and won't be smooth. When it's cooler, the pain spreads over the scratch more evenly. The tip of this touch-up pen is very thick for small scratches and chips. Instead, we are going to use a toothpick. 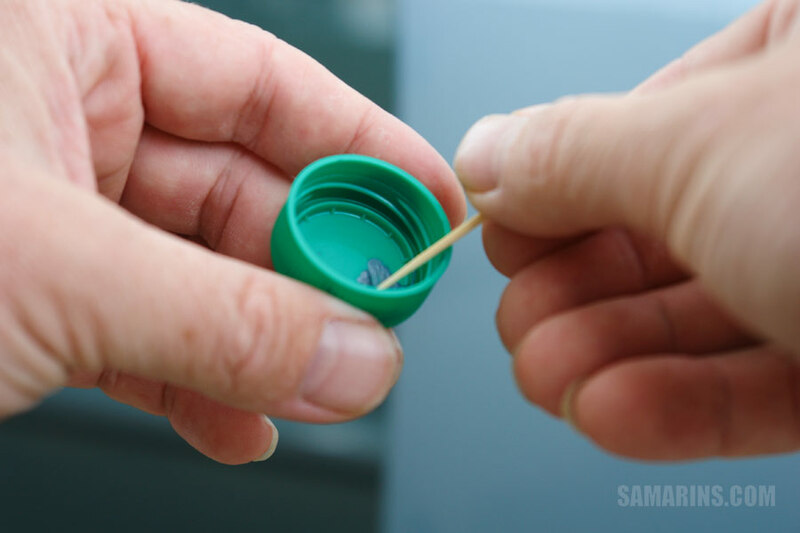 We shook the pen well and squeezed a small amount into the clean bottle cap. You'd have to press the pen down a few times to get the paint coming. Here, we use a toothpick to apply the paint. Now fill up the scratch carefully. If you applied a bit too much, wipe it out right away with the clean towel and try again. Now, this scratch doesn't look as bad as before and it won't rust. It's not perfect, but it looks better and it won't rust. In a half an hour, when the paint dries up, add the layer of the clear coat from the other end of the touch-up pen (instructions are on the pen) using the same process. 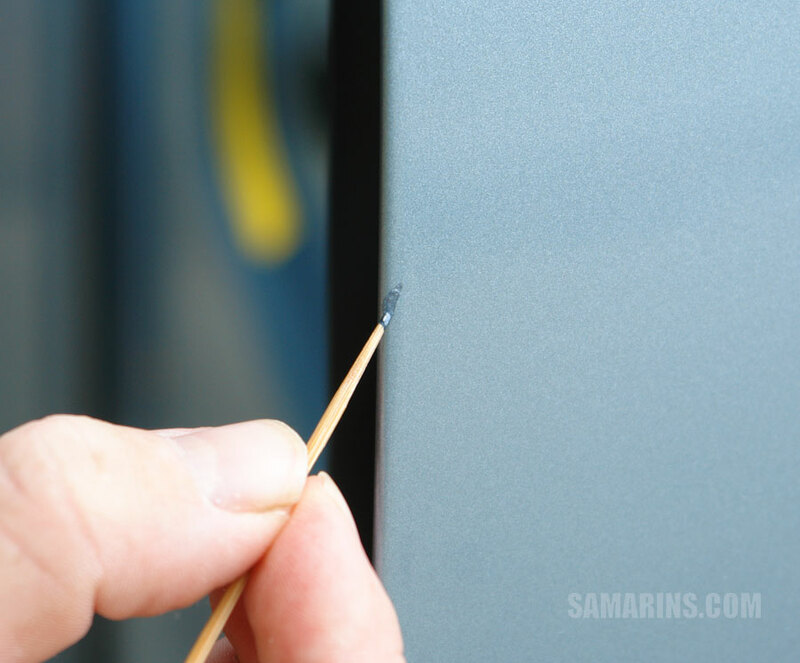 The clear coat seals the paint better and makes it more shiny. Fill up the stone chip with a small drop of paint. 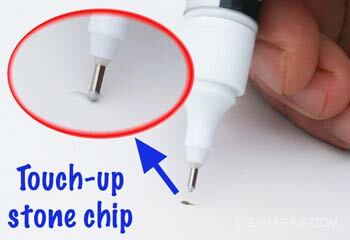 This touch up pen from Mazda has a sharp enough tip to use it on small stone chips. We washed and dried this car. We shook the touch-up pen well and did a first try on the paper to see paint coming out in matching color. Often, the first paint that comes out doesn't have the right color. Now, we filled up the stone chip, so it looks like a drop of paint on top of the chip. When the paint dries up it will shrink a bit and will be almost level with the surface. Rusted brake lines like this are a safety concern. 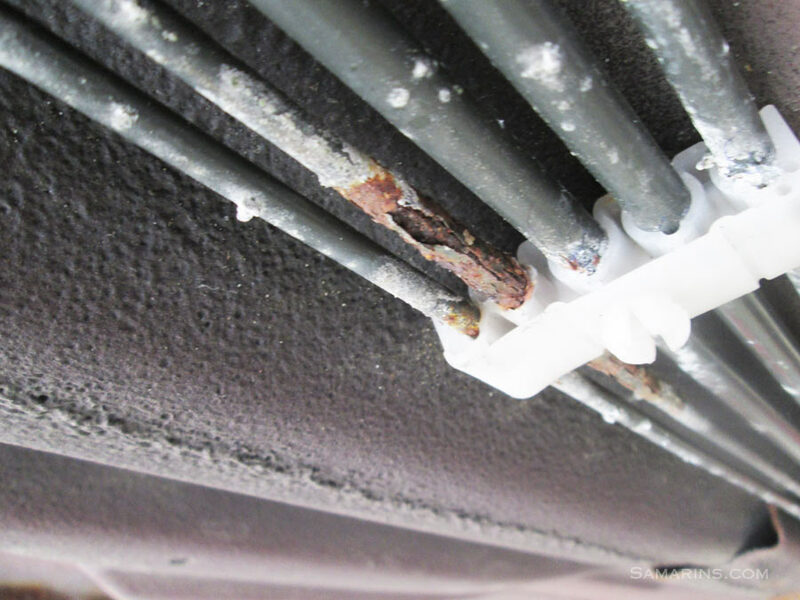 Rust damage is a concern if you live in an area where salt is used on the roads in winter. Consider rustproofing your vehicle. Many local shops offer rustproofing and undercoating and it's not very expensive ($60-$250). Yes, modern cars are protected better, but the salt and moisture are a menace to the undercarriage of any car. 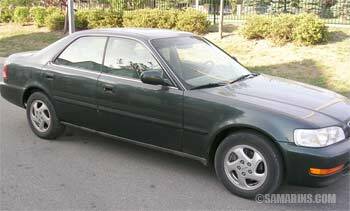 We have seen many newer cars with some rust here and there. The brake lines in the photo belong to a 10-years old car driven in the Rust Belt. In the condition like this, it's a safety concern. If a rusted brake line like this one bursts, the car will have no brakes. 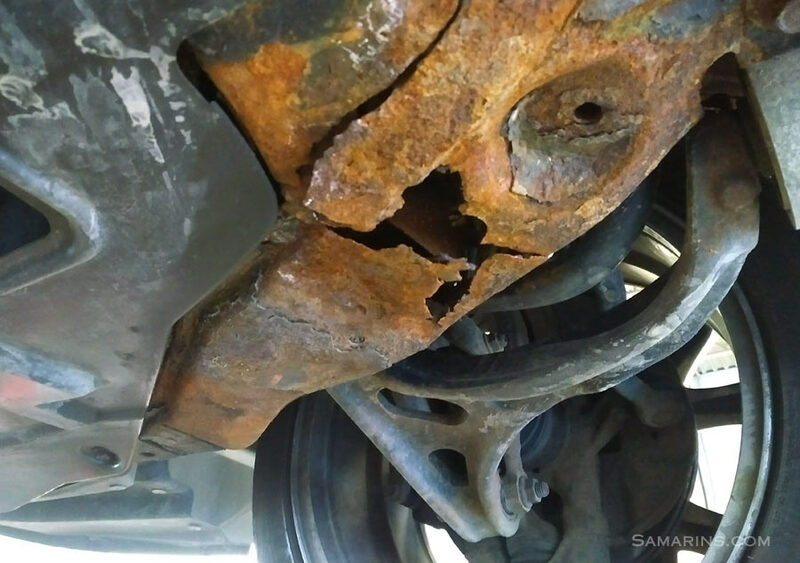 Also check this photo of the rusted subframe belonging to a 9-year old car. 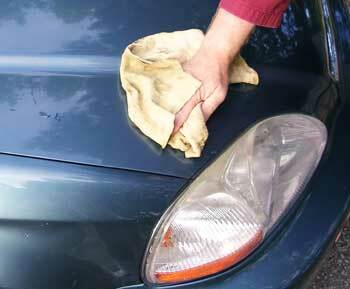 Wash your car regularly to prevent dirt accumulating in the crevices and causing rust. Why do you need to wash your car? The dirt around the mouldings, headlights and taillights and in other hard-to-reach areas accumulates moisture and will cause rust. The brake dust on the alloy rims comes out easy if you wash your car regularly, but it will be very hard to remove if it stays on the rims longer. 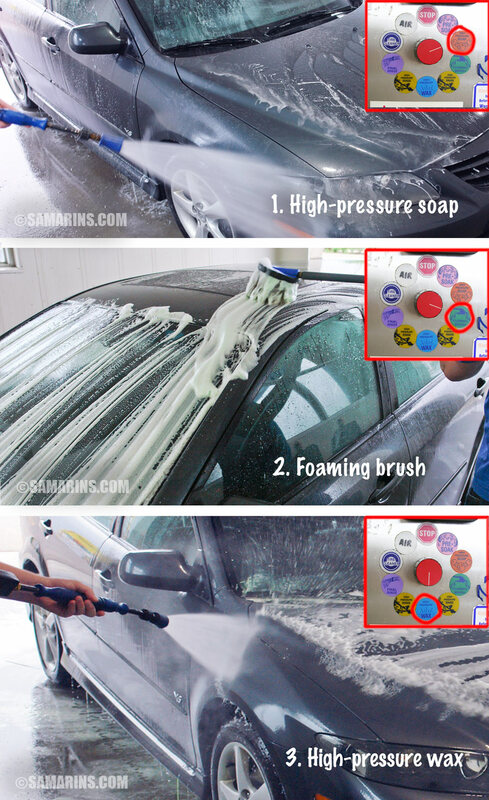 Car wash stations are everywhere, and they are not very expensive. An automatic car wash costs from $8 to $15, while if you use a coin self-service car wash, you can wash your car for as low as $3-$6. 1. Switch to High-pressure soap and pre-wash the whole car. 2. Switch to Foaming brush and brush the car starting from top and doing the wheels last. 3. Switch to High-pressure wax and rinse the car. 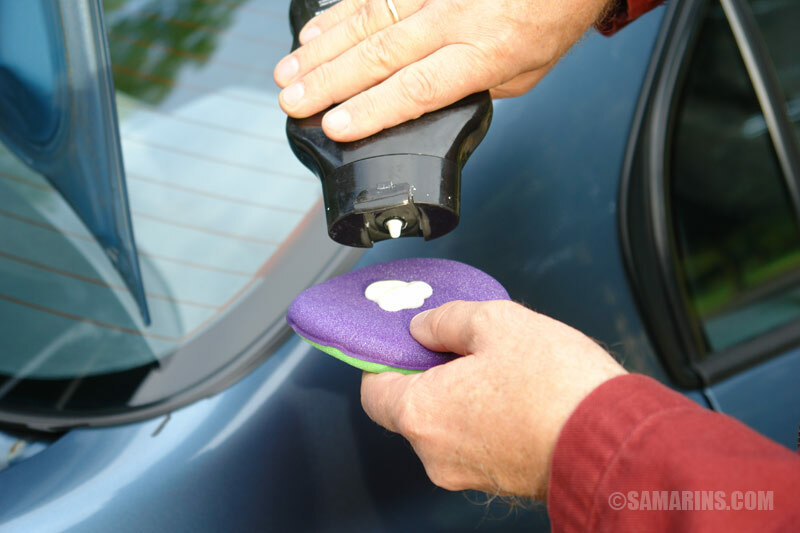 Once the car is done, rinse the brush too so it stays clean for the next person. We got it done in 6 minutes! 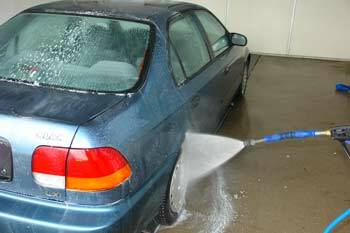 Here are Youtube videos on how to wash a car in a coin car wash.
Leaves and other debris accumulating under the windshield will cause rust and moldy smell inside the car. If you park your car under trees, you will find that some of the debris is accumulating under the hood. The problem is that leaves collect moisture that will cause rust. Leaves also clog drains. 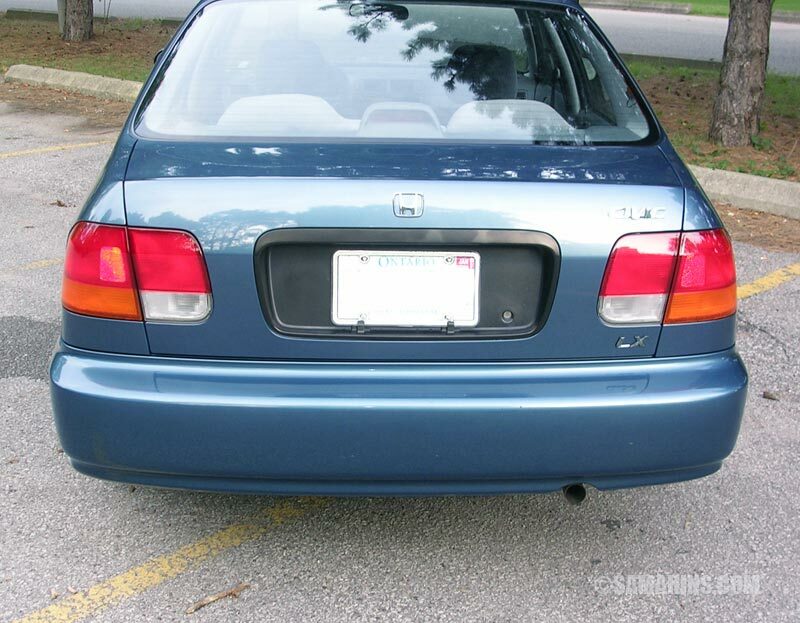 That plastic panel under the windshield in the photo is called a cowl panel cover. Under this cover there is a channel where the wiper motor is installed. Leaves falling under the cowl cover clog drains, so the water can damage the wiper mechanism and leak inside the car. Car wax seals scratches and stone chips in the paint preventing the exposed metal from rust. After waxing, a thin layer of wax covers the clearcoat, protecting it from sun fading and damage from bird droppings and other chemicals. Besides, the wax brings up the shine! How long does it take to wax a whole car? If no rush, it takes about an hour. How long does the car wax stay on the car? A good product should stay from 6 months to a year. 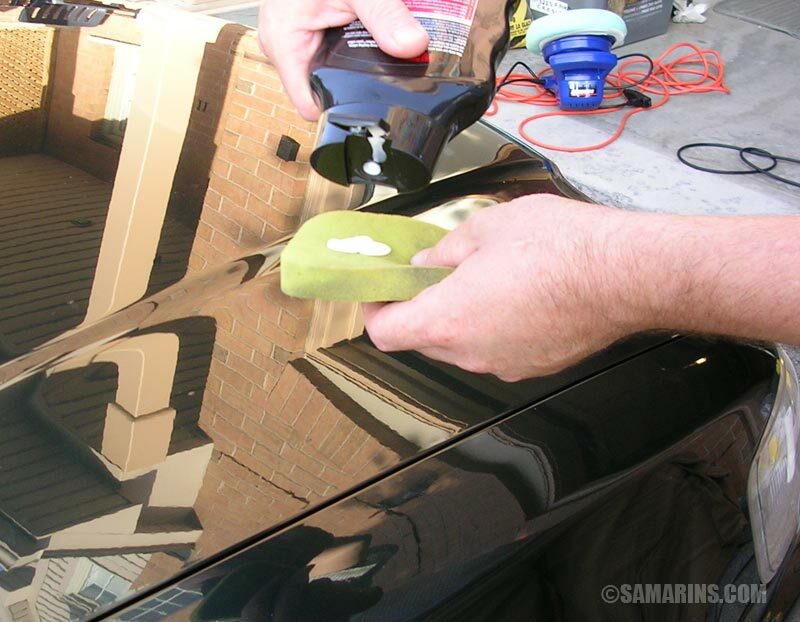 If you reapply the wax at least once a year, it will help keep the clearcoat shiny. What do you need? 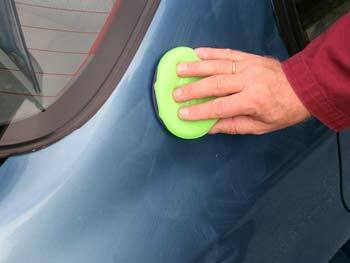 All you need is a clean sponge applicator and good-quality wax. If you want to use an electric buffer, it can help, if not a clean soft towel will do the trick. Of course, the car needs to be washed and dried first. It's easier to wax a car in a shade, when the clearcoat stays cool to the touch. First, let's see how to use an electric buffer. Work on one panel (e.g. one door) at the time. 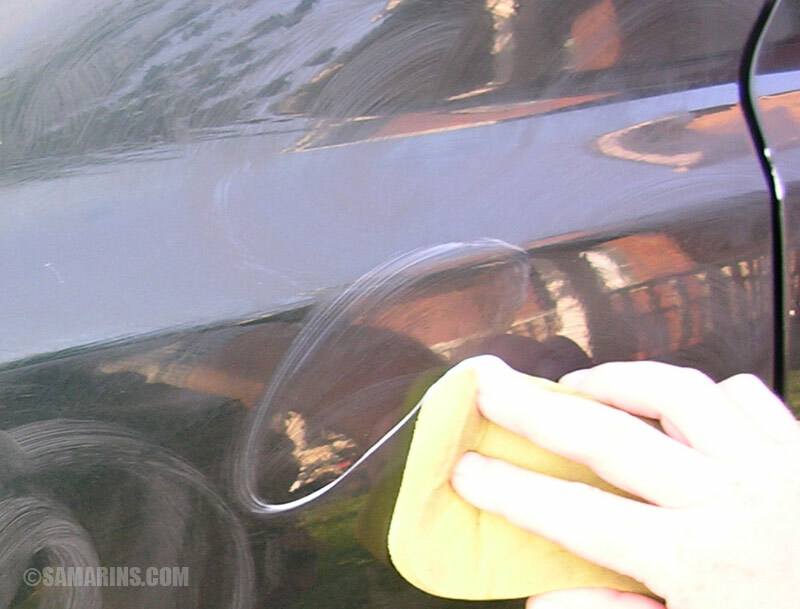 Apply a thin layer of wax with the sponge evenly. Wait a minute or two until the wax hazes. 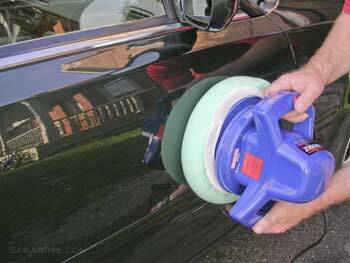 Use the electric buffer with a waxing pad at a slow speed, buff the panel to a perfect shine. Done! Not only the car looks shiny, its clearcoat is now protected! The first step again, wash the car. A coin car wash offers everything you need. If some water left, it will be harder to wax. Dry with a clean chamois or towel. Spread thin layer of wax evenly, do one panel at a time. Give the wax a minute to dry up. Buff with a clean soft cloth until it looks even and shiny. Buff with a clean soft cloth until it looks even and shiny For better results, flip the towel frequently. Waxing this car took didn't take more than 40 minutes, and it's a good workout. 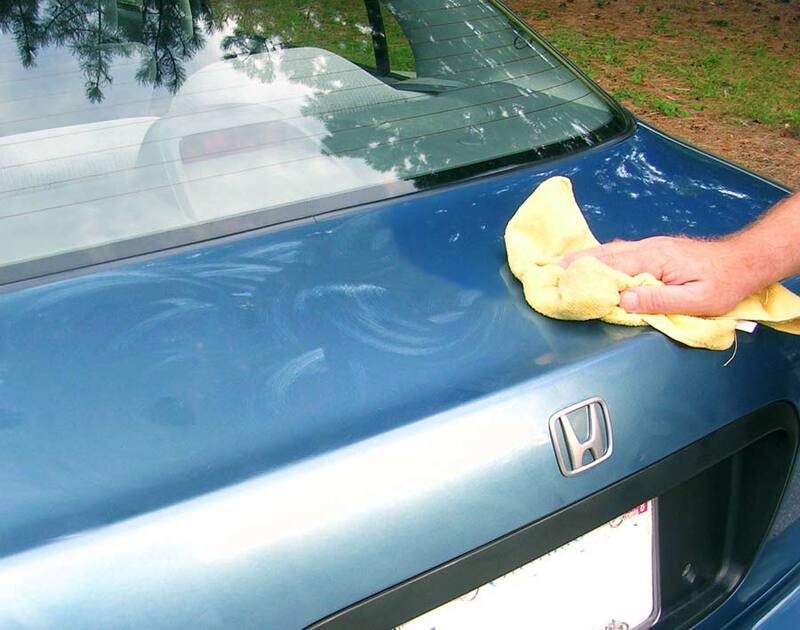 If you want to see more ways to wax your car, check these Youtube videos. Do your headlights look like this? You might also notice that it's harder to see the road at night. Is it a safety concern? Of course! 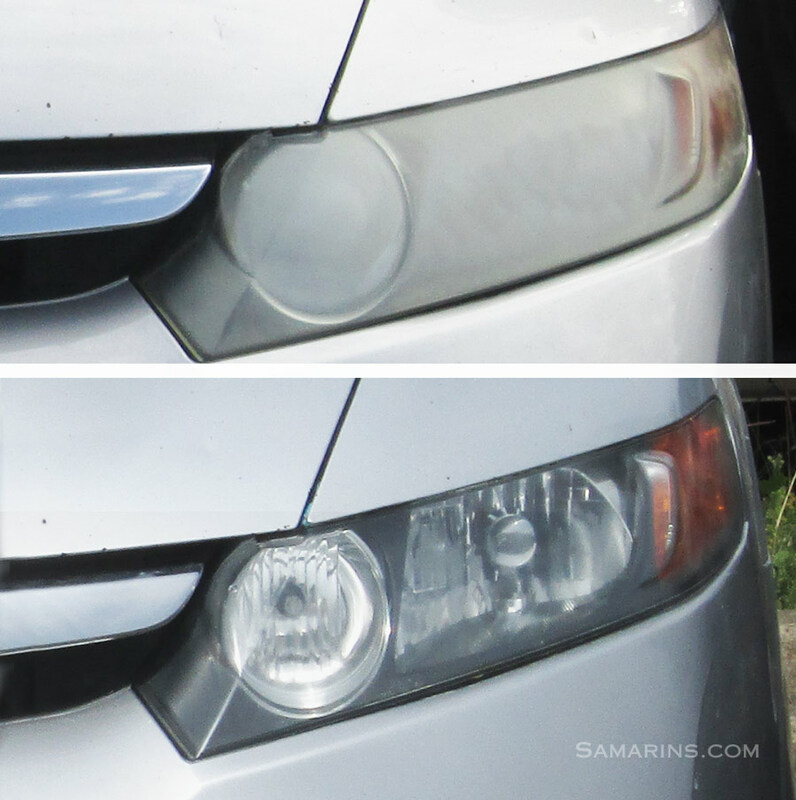 It's not that difficult to restore faded headlights, as long as they fogged up on the outside. 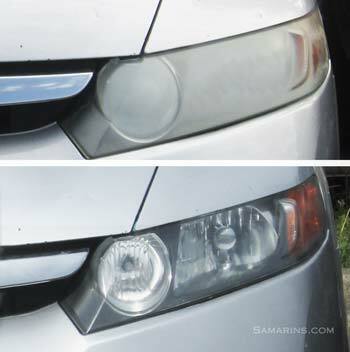 See these Youtube videos on how to restore dim headlights. 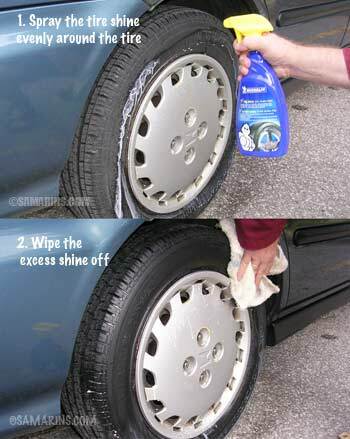 A good tire shine product also protects the tire sidewall. Spray evenly around the tire, then wipe the excess off. Youtube also offers plenty of instruction.